Untuk tidak menghampakan permintaan aunty2 (chewah! ), sa pun datang juga la to the reception. Thanks to Mel yg susah2 ambik sa di airport ni. kesian dia termiss all the nice & delicious food served during the reception. But then she said, she sempat makan the appetizer before leaving the reception, by the time kami sampai sure sempat mkn dessert. Dapat mkn pembuka & penutup hidangan, ok suda tu she said hahaha (ko kasi sedap hati sa seja tu kan mel? hahaha).. anyway it was nice of them to left some food for me & mel... kenyang juga la! 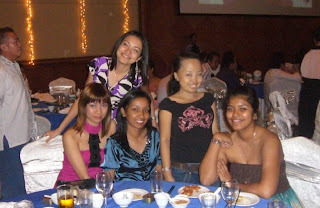 Then there was the open-floor dance... no one from my table berani mo pi menari.. haha.. I felt a bit weird having to attend the wedding in my sporty outfit (plus the eye-bag! 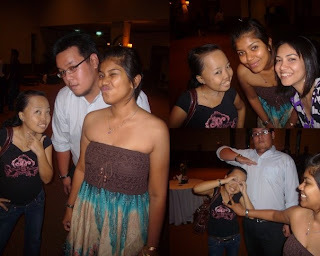 :p ), but anyway, i'm just glad that I attended the reception & bear witness of such a lovely wedding. The wedding of my cousin Mae & Asun. Next, it's goin' to be my cousin Brian's wedding! Can't wait!